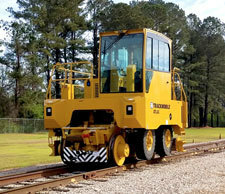 LaGrange, GA - Trackmobile announces its new Atlas model that is designed to better accommodate rail application locations requiring greater tractive effort due to unfavorable conditions or applications requiring longer strings of railcars to be moved in onsite rail spotting and switching activity. Delivering 43,900 pounds of single coupled tractive effort, and 60,200 pounds when double coupled, the Atlas not only offers more capacity but also offers state of the art operator comfort, ease-of-use, and includes many options as standard equipment. On-site testing of the Atlas at several different customer locations with challenging environments has proven that the new design delivers as promised and more. “The Trackmobile Atlas is not only the highest capacity model we have produced to date, but as with all Trackmobile models, it provides the most consistent tractive effort in applications with adverse track conditions and in inclement weather in the industry,” stated Michael Young, Trackmobile North American Sale & Marketing Manager. “The shorter wheel base and machine length are a real asset when it comes to the equipment being agile and easy to maneuver”, he added. Visit the Trackmobile booth at the GEAPS expo, booth 1553 to get more information on how Atlas can help improve operational performance in your facility’s rail applications. If not attending, visit www.trackmobile.com to find a distributor near you and learn more about the new Atlas model.